England's 2-0 victory against Poland at Wembley on Tuesday ensured their qualification for the 2014 World Cup, their fifth successive appearance in the finals. With less than eight months until the event begins, BBC Sport considers what happens next for Roy Hodgson and his players and takes a look at what lies in store when the tournament begins in Brazil. Time for Hodgson to take a breather? No chance. While England have avoided the pitfalls of November's play-offs, if the Football Association has its wish, the national side will use that international break to take on two potential World Cup opponents, Germany and Australia. Those matches could provide contrasting tests. Germany won their group with nine victories from their 10 games, while Australia were recently thumped 6-0 against France and promptly sacked coach Holger Osieck. After those matches England's preparations will continue with a fixture on Wednesday 5 March. Denmark have been pencilled in as potential opponents. That is likely to be Hodgson's last mid-season chance to tinker before naming his 23-man World Cup squad. That has to be submitted by 2 June - three weeks after the end of the Premier League season. Several pre-tournament friendlies are sure to be arranged at a later date. When will England discover their opponents? Group of Death or easy path to the knockout stages? England will find out the size of the task facing them on 6 December. At the 2010 World Cup, Fabio Capello's side looked to have a favourable draw but made heavy work of progressing from a group including United States, Slovenia and Algeria, eventually finishing in second position. On that occasion they were seeded, but England's name will not feature when the seedings for Brazil 2014 are announced on 17 October. There will be four pots of eight teams, with pot one comprising Brazil and the top seven qualifiers from the Fifa world rankings. Sadly for Hodgson, England are currently 17th in that list so will not be in pot one, placing them in a group with one of the world's best sides. Geography is a significant factor in the whole process. Pots two, three and four will be split by regions, keeping teams from the same qualifying areas apart during the group stage. The main draw will take place in Bahia, Brazil and will be screened live across the BBC. As there will be 13 European representatives at the finals, a maximum of two will be permitted in each of the eight groups of four. Who will they be up against? Hosts Brazil qualify automatically, and they will be joined by a total of 13 teams from Europe, five from Africa, four from South America, four from Asia, three from North and Central America and the Caribbean, with the remaining two places decided by inter-confederation play-offs. Belgium, Germany, Italy, Netherlands and Switzerland were the first European countries to qualify while England, Spain, Russia and Bosnia-Hercegovina joined them on Tuesday. The final four places will be decided by November's play-off matches. Argentina, Colombia, Ecuador and Chile are the South American teams to have booked their places in Brazil, while Australia, Iran, Japan and South Korea have qualified from Asia. Costa Rica, United States and Honduras are through from North and Central America and the Caribbean federation. It's time to get your plans sorted - book time off now or face the prospect of working when the big games are on. Brazil will open the tournament in Sao Paulo on 12 June and the group stages run until 26 June. That's 15 consecutive days of games before the first break, on 27 June. Day three is a significant one for the diary, with a World Cup high of four fixtures running virtually back to back. The round of 16 matches take place from 28 June to 1 July, with two fixtures each day. The quarter-finals are on 4 and 5 July, also two a day, and the semi-finals on 8 and 9 July. 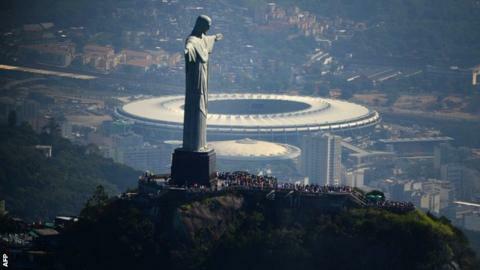 The World Cup final will be in Rio de Janeiro on Sunday 13 July. A total of 6,164,682 requests - almost double the total available - came from 203 countries, with more than 70% from Brazil. Some 96,780 requests were made from England. Tickets not allocated will be available on a first-come, first-served basis from 5 November. Fans will be allowed to buy tickets again on 8 December following the World Cup draw - these will be randomly selected. There will be two final sales phases in 2014, both first come, first served. Organisers expect a total of nearly 3.3 million tickets to be available, but only about one million were offered in the first phase. Will I be able to watch on TV or will I be working/sleeping? If you like your evenings full of non-stop football and don't mind a late night, then you are very much in luck. After Brazil's opening day game, there follows a 10-day period with three matches per day, kicking off at 17:00 BST, 20:00 BST and 23:00 BST. The second-round matches take place at 17:00 and 21:00 BST, the quarter-finals at 17:00 and 21:00 BST, the semi-finals at 21:00 BST and the final at 20:00 BST. Depends where the game is. Brazil is the world's fifth largest country, has three different time zones and a distance of more than 3,000 miles separates the northern city of Boa Vista and the southern city of Porto Alegre. The World Cup will be staged during Brazil's winter months but humidity will be a key factor, with that becoming less of a problem the further south you travel. The north-west city of Manaus is likely to cause the biggest problems humidity-wise, while the southern cities of Rio de Janeiro, Sao Paulo, Curitiba and Belo Horizonte are predicted to have more comfortable temperatures (mid-20s) for much of the tournament. What kind of World Cup will it be? If you think English supporters are passionate about football, wait until you see the Brazilians in full flow. Fans there need no excuse to dance, drink and party when a football game is on and when the national team plays, the famous yellow shirt fills the streets. But do not mistake that for a carefree attitude. Supporters demand success of a team which has won the World Cup on a record five occasions. Brazil has staged the World Cup only once before, in 1950, when they were beaten by Uruguay in the final. It will be the first South American World Cup since 1978 in Argentina and the first time successive World Cups have been held outside Europe, following the 2010 event in South Africa. It will also be the first time consecutive World Cups have taken place in the southern hemisphere. Another landmark will be the use of goal-line technology for the first time in the finals, with German-based manufacturer GoalControl chosen to provide the data. It was introduced on the international stage this year when Brazil staged the Confederations Cup for the first time, although there were no controversial decisions which required it to be used. Seen as a dress rehearsal for the World Cup, the Confederations Cup in Brazil was considered highly successful, with ticket sales of 800,000 easily surpassing the figures for the tournaments in South Africa in 2009 and in Germany in 2005. Brazil beat Spain 3-0 in the final to win for the third time in succession. Six of the 12 stadiums hosting the World Cup are still being built, with five of them behind schedule. The Maracana in Rio, one of the world's most iconic stadiums, will be the venue for the final and six other matches. Once the largest football ground in the world with crowds of 200,000, the stadium has been refurbished with a new roof and now has a capacity of 73,531, still the largest in the country, and staged this year's Confederations Cup final. Eight of the venues are on the coast. Inland, the newly constructed Arena Amazonia in Manaus is the most northern point. It will host four group-phase matches and has a capacity of 42,377. The Arena Pantanal will also have four group matches and has a 42,968 capacity. Brasilia's Estadio Nacional hosts seven matches, including a quarter-final and boasts the second largest capacity of the finals, 68,009. The Estadio Mineirao, home to Atletico Mineiro and Cruzeiro, has been completely overhauled and will have six matches, including a semi-final, with a 57,483 capacity. Along the north-east coast, the revamped Castelao in Fortaleza has been increased to 58,704 and has six World Cup matches, including a quarter-final. The futuristic Estadio das Dunas, with a unique undulating design intended to imitate sand dunes, has been created in the Natal region with a capacity of 42,086 and will have four group matches. The Arena Pernambuco in Recife is another new construction, a 44,248-capacity venue hosting five matches. There is another purpose-built stadium in Salvador, constructed on the site of the old Fonte Nova, the Arena Fonte Nova, covered by a lightweight, metal roof, which holds 52,048 and will stage six matches, including a quarter-final. Further down the coast is the Arena de Sao Paulo, a newly built stadium which will host the opening match of the tournament with a capacity of 65,807, around 20,000 of which will be temporary seating. The Arena da Baixada in Curitiba holds 41,456 and will stage four group matches. The furthest southerly point is the Estadio Beira-Rio in Porto Alegre, which will host five matches and has been renovated with an innovative metal roof and a capacity of 50,287. Can Brazil now take Spain's World Cup title? Read more on Are Brazil World Cup contenders after Confederations Cup win?